These chilling words from two survivors of a brainwashing prison in Pitesti, Romania are sad reminders of the legacy of Stalinist communism. Beyond Torture: The Gulag of Pitesti, Romania documents the persecution of Romanians under the communist regime. Electrical shock, hallucinogenic drugs, near starvation and fatal beatings were daily rituals in the prison of Pitesti, Romania. But this sadistic story goes beyond torture: this was an attempt to totally destroy a people’s culture and faith. 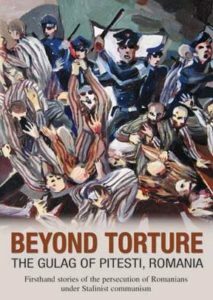 In this documentary, you’ll meet three survivors from the prison of Pitesti and see shocking paintings that capture the essence of the extreme torture. This DVD also includes an in-depth one-hour interview with Father Roman Braga: prison survivor and spiritual leader. Outside of Romania, this film is the first major historical documentation of the Pitesti experience.